This particular organization seeks to display data from their Video Management System (VMS), in addition to traffic light status, street maps and TV news feeds. They require a solution that is completely independent of their VMS to visualize these additional sources, which are important to make decisions in situations of emergency. 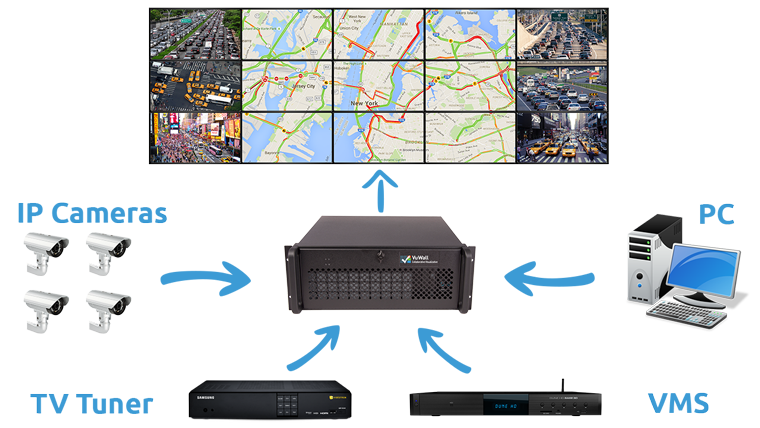 A VuScape video wall controller was installed to decode IP cameras as well as capture VMS clients along with other computer sources. This setup allows the organization to select and display all the data simultaneously on a single video wall surface using the drag-and-drop user interface. The primary advantage of this configuration is that the VuWall system is non-intrusive to the VMS software, which simplifies any software upgrades for either system. The intuitive user-interface of VuWall2 makes it easy to manipulate multiple sources of information from a single point of control. This solution allows the operator to position the data as needed during emergency situations.